Commercial Plumbing Companies, FishHawk| A Step Above Plumbing Inc. Commercial Plumbing Companies, FishHawk| A Step Above Plumbing Inc. Unlike many other commercial plumbing companies in FishHawk, FL, we can make appointments on Saturdays and Sundays. It’s true that sometimes that clogged toilet just needs a good plunging, but other times, there could be a more serious problem occurring behind the scenes. 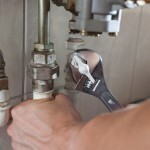 If you cannot fix a problem with your plumbing yourself upon noticing it, it is best to turn to commercial plumbing companies for your repair needs at your business. Whether you are a small office with just a few rooms or a large building with lots of employees and/or guests, you want to avoid having any major plumbing mishaps. At A Step Above Plumbing Inc. we can help you avoid plumbing disasters at your FishHawk, FL business location. We have over 10 years of experience in the area and are certain our professionals can help with any problems you may have. Another thing to consider when hiring commercial plumbing companies is if you are going to get plumbers who are knowledgeable about building codes and protocols. Not only can we help with whatever plumbing problem you throw at us, but we will also make sure that your building isn’t violating any codes during and after the repair process. We are available Monday through Friday from 7am to 5pm, and unlike many other commercial plumbing companies in FishHawk, we can make appointments on Saturdays and Sundays. With this flexible schedule and our policy that we show up when we are scheduled to, we can ensure that your needs are met at a convenient time and in a timely fashion, so give us a call today.